The Land Transport Authority says devices must weigh no more than 20kg and be aligned to the European Standard EN15194. It is also introducing bigger fines for those using non-compliant power-assisted bikes with immediate effect. 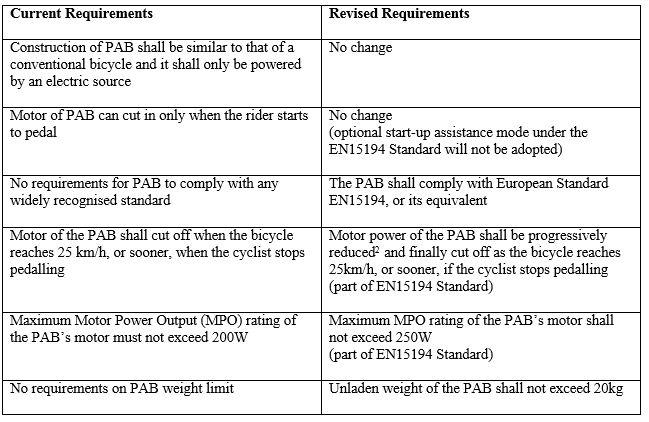 SINGAPORE: The Land Transport Authority (LTA) on Thursday (Nov 19) announced tighter regulations for power-assisted bicycles (PABs), as well as stricter penalties for those who sell and use non-compliant PABs. In a media release, LTA said new rules will kick in from Dec 1. With the new regulations, each device must weigh no more than 20kg and must be aligned with the European Standard EN15194 which requires the PABs to undergo more rigorous tests, LTA stated. Models which comply with this standard are harder to illegally modify. Currently, PABs must meet basic technical requirements before they are approved by LTA. For example, their construction must be similar to that of a conventional bicycle and they can only be powered by an electric source, which can only cut in when the rider starts to pedal. "Special attention is being paid to PABs because they are currently allowed on public roads, and hence there are significant safety concerns," said LTA. LTA said the number of offences involving the use or sale of non-compliant PABs has been increasing over the years, from only 11 notices issued in 2008 to 1,280 notices issued between January and October this year. To stem this trend, with immediate effect, the composition fine for first-time offenders will be raised to S$300, up from the current S$100. Subsequent offences will attract composition sums of S$500, up from the current S$200.